Running a business is very challenging, whether it is a multi-million dollar corporation or a division of a company. Not only is it challenging to stay ahead of the competition, but it's also tough to keep an increasingly transient workforce engaged and committed to the success of your organization. 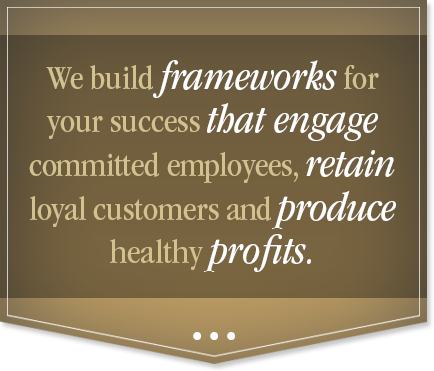 It is important to set up a framework for success that engages committed employees, retains loyal customers and produces healthy profits. Since 1984, we have worked with organizations to define their mission, create their vision and develop strategies that will make their vision a reality. The first element, vision, is the setting of a clear, focused, desirable direction that will take your organization to some specific destination. As the old saying goes, "if you don't know where you are going, any road will do." It is the same with companies, and even divisions, departments and individuals. If there is no vision, you can do a lot of work and go nowhere. Vision does more than create a desirable endpoint. The potential for success is created at the strategic level. Strategy, the second component, lays out the plan for how to make the vision a reality. "Failing to plan is planning to fail." Ever hear that adage? Strategies help companies, divisions or departments stay focused on the most important actions that will keep positive forward progress toward achieving the vision. They serve as guidelines, determining what kind of goals should be established at the operational level. Good strategic plans include balanced focus on these four areas: finances, customer and competition, processes, and people. They are supported by the company's culture and not impeded by it. While potential for success is created at the strategic level, potential becomes success at the operational level. There are many who create great plans yet fail to realize their goals and vision. Execution, the third element, is where the rubber meets the road. It is at this point where the goals and objectives, measurements and accountability come into play by way of action plans and prioritization. This is where managers provide the coaching, direction and support that people need to do their jobs successfully, making contributions to the overall success of the organization. This is where the resources, such as money, time, equipment and tools are planned for and provided.